Venez profiter de notre vue privée de l'océan Puerto Vallarta maison de vacances. Il est niché à quelques pâtés de maisons de l'eau parmi les rues pavées dans la partie historique de la ville coloniale. Idéalement situé à distance de marche des nombreuses installations de Puerto Vallarta. A l'extérieur, la maison dispose d'un jardin privée fermée avec des palmiers et de nombreuses plantes tropicales. A l'intérieur, il peut accueillir quatre personnes; un lit dans la chambre et deux jours lits dans le salon. Il ya une cuisine complète avec une cuisinière à gaz et tous les équipements de cuisson. Il suffit de cuisiner à la maison avec les aliments frais vendus à proximité ou à pied de l'un des nombreux restaurants gastronomiques. En plus de la salle à manger intérieure, il ya une magnifique terrasse couverte de manger avec un barbecue, qui sert de salon / salle à manger en plein air. Delight dans l'architecture mexicaine de style traditionnel avec le toit espagnol tuiles, mosaïques mexicaines colorées, floorplan ouvert et hamacs étonnantes de se prélasser sur. Venez passer une semaine, un mois, ou plusieurs mois pour se détendre sur les belles plages, visite les villes environnantes de montagne ou de prendre langue espagnole, le yoga, ou des cours de cuisine dans la région. Nous espérons que vous adorez nos hacienda authentiques autant que nous faisons! Location is among a densely populated area so be prepared to sleep with ear plugs as the urban Mexican culture means lots of urban noise, lots of noise. Try and book a time when rain is not in the forecast as you will be mopping the floors and moving your luggage from the closets to some drier areas of the house, which seemed to be the outdoor covered patio. Overall the house is extremely quaint, just wished it did not rain during my stay or the neighbourhood was a bit quieter. And remember to put away any fruit or vegetables as the friendly squirrel will be enjoying your food. The house has an open portion and that squirrel will come right in for a visit. Other than the rain and noise this house is a nice place to experience a true urban mexican neighbourhood. Zona Romantica next year, much quieter. Clean. Great location. Lots to explore nearby. Don"t waste your money. Even at low season rates, a total DUMP. Trash everywhere throughout the neighborhood. My wife and I rented this supposed "Charming Water View Vacation Home" for the month of January 2017. Our first mistake was even stepping foot in this complete dump. We left after 10 days of misery and are still trying to recover from the experience. Let start with the neighborhood. If you enjoy having garbage stacked on every corner, dogs barking and people yelling at all hours of the night your in luck. The young lady who met us at the house informed us not talk to or engage the 5 or so men alway hanging around the building across the street. She informed us that they may try to get in the house. Very comforting. Upon entering this "perfect Mexican house" you will find a dirty barely livable structure filled with old worn out everything. The kitchen and bathroom are disgusting. The bed is basically a board. The bedding is old and just disgusting as is all the linen. This is a Mexican peasants house. You cannot drink the water in the house nor can you flush toilet paper. You must put it in the trash can and everyday throw it and your trash on the stack on the corner. Forget about leaving any food out on the counter as the rodents will eat everything. The bed and all the furniture is filthy and would not be accepted by any charity in this country. Did I mention that a street runs just below the bedroom window, forget about sleeping with the cars and motorcycles racing up and down all night. I don't know where the other reviewer stayed but they must either be friends of the owner or this is a step up from the trailer park they live in here. I could go on but no one should stay here it should be demolished. We have not asked for or received a refund nor do we expect one. This was our mistake "Caveat Emptor"
We are sorry that you did not have a positive experience but more than that, we are deeply saddened that you could not fully appreciate what our house and our neighborhood has to offer. 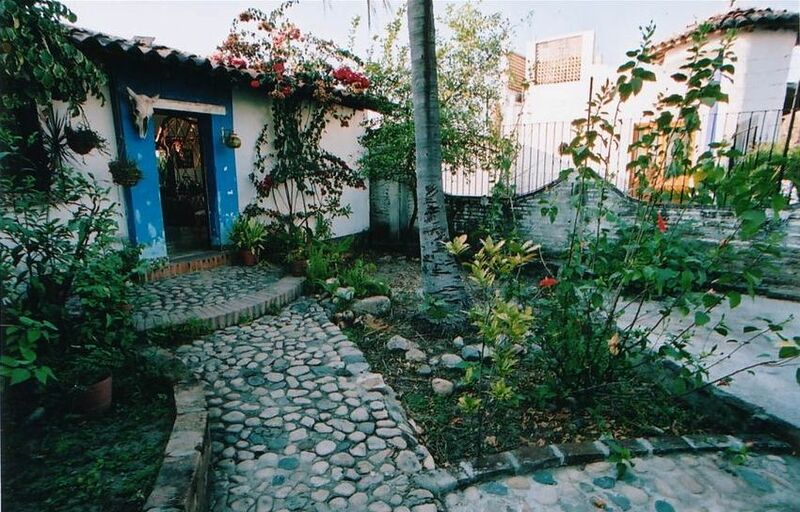 Casa Myito is in a authentic neighborhood in the hills of "Old Town" Puerto Vallarta. Our hacienda was built by a famous Mexican architect on a very old cobblestone street, just 5 blocks up the hill from the oceanfront Malecon. It is nestled between the millionaires and the locals; Europeans, Americans and Mexicans live here year round. Old Town is a diverse urban environment with a distinctive local soundscape. Unlike a resort, Casa Myito is quaint and unique. See the photos. The tiles in our bathroom and kitchen are of a typical style. Our roof is made of traditional terra-cotta tiles. The furniture is authentic traditional Mexican style made locally. It's an open floor plan with a tree growing in the middle of the house. Casa Myito is not insulated from the typical street noises you'll find all over Mexican cities and towns, where real Mexican people live. You will hear the water truck announcing its advertising as it drives through the tiny streets. You will hear the Sunday evening family parties, the children laughing and playing late into the night. You will hear the nightly pirate ship on the bay shooting off it's cannon. You will hear the locals arriving home on their motorcycles. You may even hear roosters at all times of the day. When we visit, we find these sounds to be very charming and part of the experience of being in a 'real' part of Mexico. All of Puerto Vallarta has older plumbing and even many hotels ask that toilet paper is disposed in the trash can. If the water is not filtered, it is not safe to drink. A typical feature of a small city in Mexico is that trash is collected on the street corner. This is the way they do it. Old Town is famous for it's Hollywood history. Richard Burton and Elizabeth Taylor each built their own homes 3 blocks from ours. The director John Huston, built his home, 1 block from ours. In the neighborhood there are small hotels with rooftop bars featuring 360 degree views of the ocean, city and surrounding hills. There are gourmet restaurants and tiny family Mexican restaurants. The corner bodegas are convenient for necessities. There is even a wonderful yoga studio with rooftop yoga. Old Town is truly a gem. The perfect place to enjoy Puerto Vallarta! We loved this little house in a local neighbourhood of Puerto Vallarta. While it is only 3 blocks from the malacon, it feels like you are miles away from the tourist crowds. The little "tiendas" on almost every corner have almost everything you need and the local veg and meat market is a 15 minute walk. Don't bother going to a supermarket, everything you need is within walking distance, and exploring the neighbourhood is great fun! I will definitely stay here again on our next trip to P.V. This charming place is my idea of the perfect Mexican house with indoor outdoor living full of charm and plants. It's a steep walk down the hill to the beach (6 blocks), but that's called built in free exercise. If you'd rather not, taxis for $4 are easy to come by. There is a bodega around the corner with everything you need, including cooked delicious Mexican beans, Tequila, fruit, toothbrushes...everything we asked for she had. Yoga dans la rue, Maison et Jardin Tours, Art Walk, galeries d'art, marché, à quelques pâtés de Centre ville, la cathédrale, le Malecon, écoles espagnoles, à quelques rues de Elizabeth Taylor et de la Chambre de Richard Burton et le musée, promenade facile à tous Les équipements de Puerto Vallarta.